As travelers who love train journeys we always explore the possibility of including them into our plans where possible. 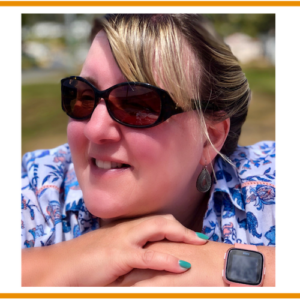 So when we started planning a trip along the west coast from Seattle to Los Angeles our first choice was to book the Amtrak Coast Starlight. The train runs from Seattle, Washington to Los Angeles, California via Portland’s Union Station, Sacramento, the San Francisco Bay area and Santa Barbara. The Coast Starlight passes through areas of spectacular natural beauty and provides a comfortable and luxurious alternative to flying. The train runs daily and covers a distance of 1377 miles over 35 hours. There are a total of 28 stops along the way. 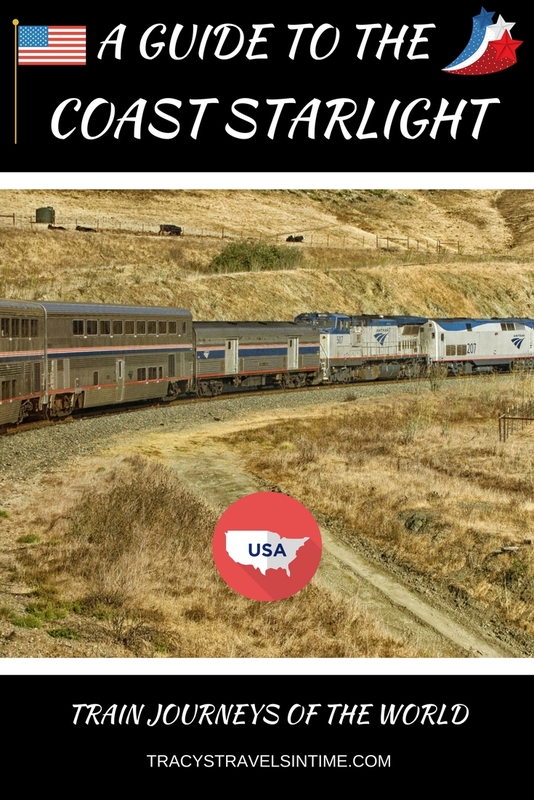 If you are considering booking this service read on for a comprehensive guide to the Amtrak Coast Starlight! 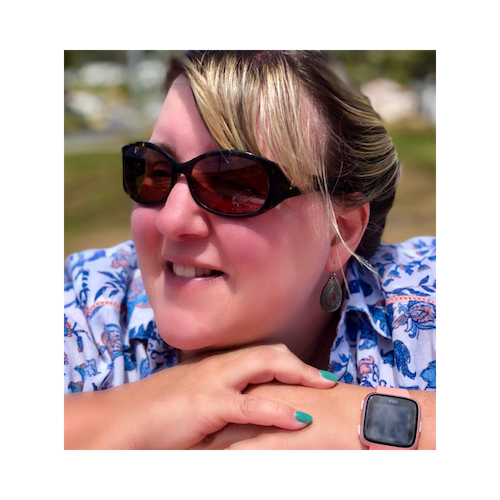 ACCOMMODATION OPTIONS ON THE COAST STARLIGHT | WHAT IS THE JOURNEY LIKE? WHERE DOES THE COAST STARLIGHT STOP? | WHAT IS THE SCENERY LIKE ALONG THE WAY? 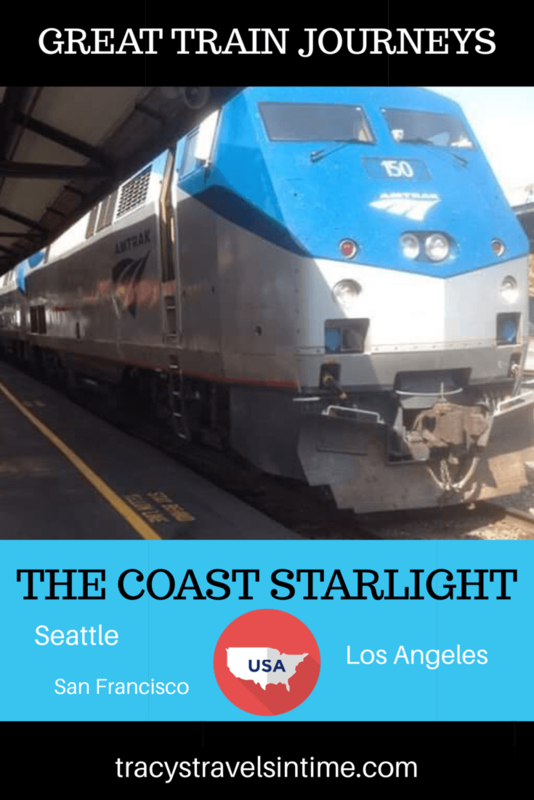 ROUTE MAP OF THE COAST STARLIGHT | THINGS TO KNOW! When reserving your tickets with Amtrak there are a number of accommodation options to choose from to suit all budgets. These range from reserved coach class seats to sleeper services in the Superliner Roomettes and Bedrooms. We chose to reserve two roomettes as we were travelling with our adult daughter. The roomettes consist of 2 seats alongside the window. At night the seats are converted into a single berth with another single berth folding down from the ceiling. Along with all your meals you have access to the lounge car during the journey. Although Wi-Fi is not available in the roomette it is accessible in the lounge car. 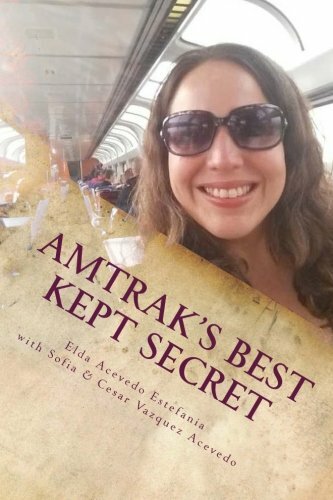 WHAT IS THE JOURNEY LIKE ON THE AMTRAK COAST STARLIGHT TRAIN? Organisation at King’s Station was good with the checking-in process smooth. It is well signposted and there is plenty of seating available while waiting for the Coast Starlight to arrive. As soon as the train arrives in the staton you can board. If you have luggage you will need to store it on the lower deck. 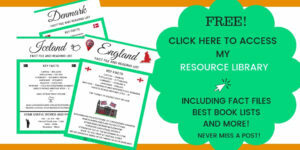 I would suggest having a smaller travel bag with all your journey essentials. If you have booked a roomette there is really not much room so a large suitcase/bag will simply not fit. As I mentioned above we had reserved 2 roomettes for our journey. These tickets allowed us access to the Parlour Car and a cinema on the lower deck. Unfortunately as a cost cutting measure by Amtrak the Parlour Car was removed from service in 2018. A tragedy. All meals are also included in the price of the ticket. The dining car hostess will come down and reserve your meal time due to the limited seating in the Dining Car. There are also optional extras which you can book and pay for once on the train – the cheese and wine tasting for example. We found the Parlour Car was a great place to meet new people and we had some great conversations with other travellers along the way. With the Parlour Car no longer in service head to the Lounge Car with its panoramic windows for some company and great views! While we were at dinner the roomette beds were made up for us by the hostess. Be aware that there is not much room and you have to have some agility to be able to access the top bunk. Although my husband doesn’t suffer from claustrophobia he did find himself a little confined once on the bunk. If you don’t like small spaces or have mobility issues I would recommend reserving one of the larger bedrooms. We found the food to be delicious and considering it is being cooked in the confines of a moving train I think they did an excellent job! WHERE DOES THE AMTRAK COAST STARLIGHT STOP ALONG IT’S ROUTE? There are a total of 28 stops at various train stations along the entire route including Portland and Sacramento. The train travels through 3 US states – Washington, Oregon and California. During daylight hours there is plenty time to take photographs at the various stations! You can even alight the train at some of the stops for a short stroll though don’t go too far! The train will depart on time whether you are on board or not! WHAT IS THE SCENERY LIKE ALONG THE ROUTE OF THE COAST STARLIGHT? After journeying overnight you will arrive at Emeryville having travelled through the states of Washington State, Oregon and into California. We alighted the train at Emeryville and caught a connecting bus service into San Francisco where we spent a few days. After a fantastic few days in the city of San Francisco we once again caught the Coast Starlight. This time we picked up the service from Oakland Station to Los Angeles. Unfortunately our experience of the Coast Starlight was marred due to the trains very delayed arrival at Oakland Station. This made us very late into LA which was a bit unsettling on our first visit. We were also in the seated coaches which unbelievably had no wi-fi. The views as we travelled through California were pretty spectacular though there was a severe drought at the time which you can tell in the photographs. A route map of the route of the Coast Starlight and the various train stations along the journey. If you are prone to claustrophobia or are not fit I would recommend reserving a bedroom as the roomette when converted for 2 adults is very small. The top bunk has to be accessed via ladder and there is not a huge amount of space up there! Enjoy the views from the panoramic windows in the observation car. Chat to people – we met some very interesting travelers along the way. Book it! Enjoy the train ride! 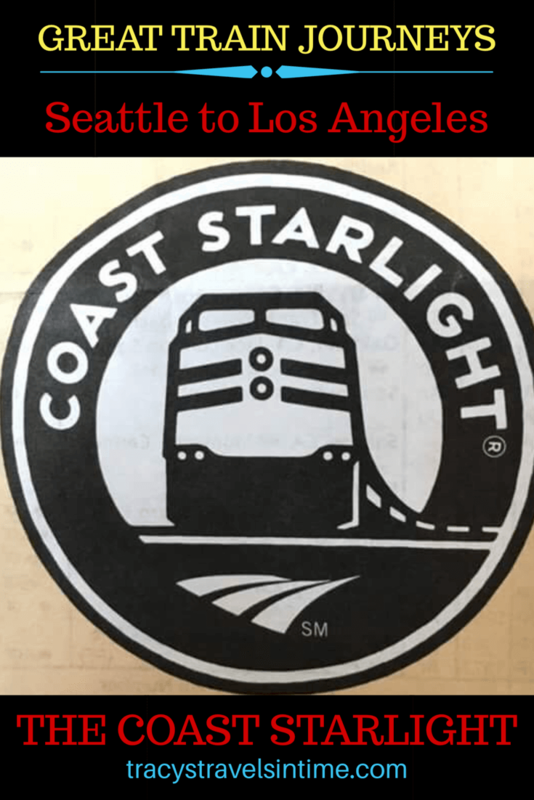 THE COAST STARLIGHT – SOME COMMON QUESTIONS ANSWERED! 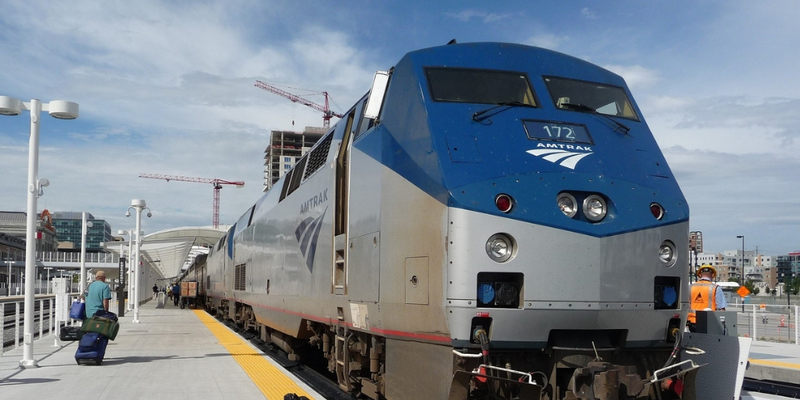 How to book the Coast Starlight? Head to the Amtrak website where you can book your tickets! Does the Amtrak Coast Starlight have wi-fi? We had wifi in the Parlour Car but not in the roomettes or in the coach class seats. Does the Amtrak Coast Starlight have showers? The roomettes have access to showers in the sleeper car. Some of the bedrooms have a private shower in the room. How fast does the Amtrak Starlight go? Not very fast! Its a slow train going at max 80 kms an hour. 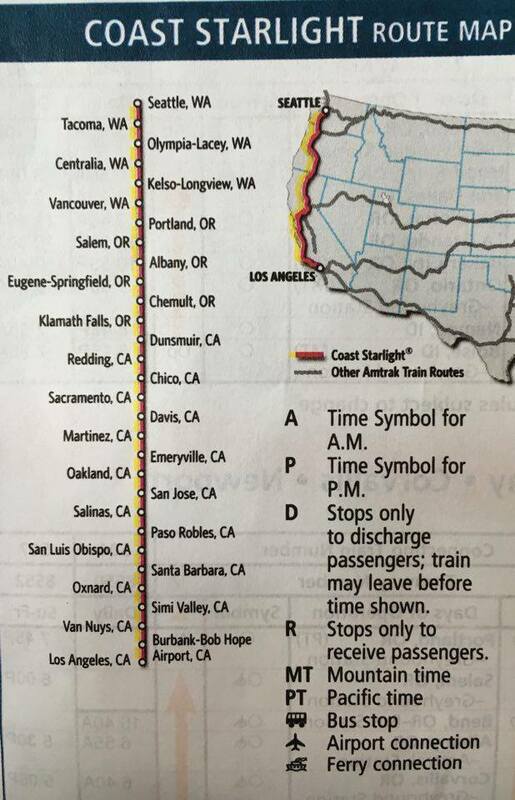 Is it possible to get on and off the Amtrak Coast Starlight at various places? You can alight the train at some stations for a bit of fresh air and a stroll. Don’t go far though as the train will leave without you! 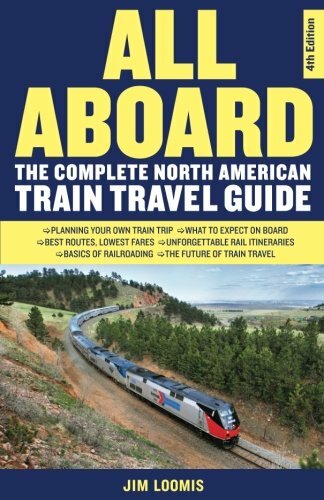 My number one choice for planning any train travel in the USA – highly recommended when planning your trip! 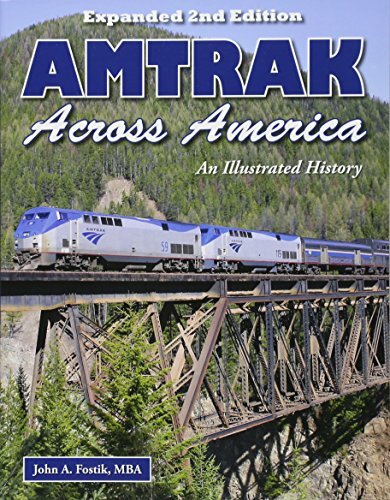 For more information about traveling with Amtrak check out the illustrated history of this most iconic of train providers. A guide to traveling the USA with a rail pass! Please feel free to ask me any questions about the trip in the comments below. If you are looking to book the Coast Starlight you can do so through the official Amtrak website. I adore long, scenic rail journeys and would love to give this train plus the Canadian and one of the luxury Indian trains a go in the not too distant future. They are fantastic aren’t they? I am looking at South Africa or Australia for our next long train trip. I would love to cross Canada by train too! Pingback: A day in Los Angeles on the Rastabus!